Visit one of Oregon's most famous archaeological sites -- the Fort Rock Cave. In 1938, dozens of sagebrush bark sandals were discovered buried under a layer of volcanic ash. The well-preserved sandals are more than 9,000 years old. 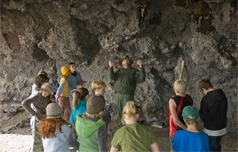 Guided tours to the National Historic Landmark are led by Oregon State Parks rangers and provide the only access to the site. The tours are $10 per person and begin at the Fort Rock State Natural Area. Tour participants are shuttled to an area near the site and then hike about one-third of a mile to the cave. More information, dates and times, and registration details are available at the Park Store .